16 p., 20 p. of plates : ill., maps ; 23 cm. 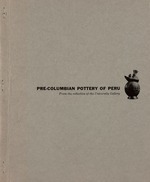 "This collection is being shown and documented in conjunction with the special photographic exhibition: Machu Picchu of the Inca, photography by Roy C. Craven, Jr. ... These two exhibitions are being presented to mark the advent of the 25th Annual Latin American Conference." c. 1534 A. D. 1590 A. D.